These funny faces demonstrate the humorous side of Mayan art. A smile is seldom seen, so there is something very unique about the pieces. They are found amongst a jumble of carved stones that were presumably recovered from the collapsed buildings to the north of the East Plaza that were swept away by the river. It is worth noting that carving was a religious activity that any nobleman may take part in and for those less able for the art of war or the ritual ball-game, it was a way of contributing to the religious efforts of the city. 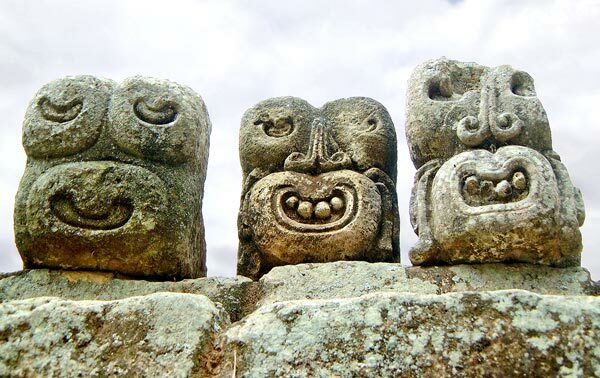 Therefore, the artwork was not always consigned by the Royal family or High Priest, and many pieces of work found at Copan were undertaken as a past-time.